This vintage gold palette brooch features an open gold painter's palette accented with large round rhinestones and two gold paint brushes.. It is 2 inches long x 1 inch wide. Perfect to advertise your business if you do paint parties or have an art studio! Vintage Avon Pin is 1-1/2 inches tall. And there is a real button on a chain. Perfect for a seamstress to advertise their business. 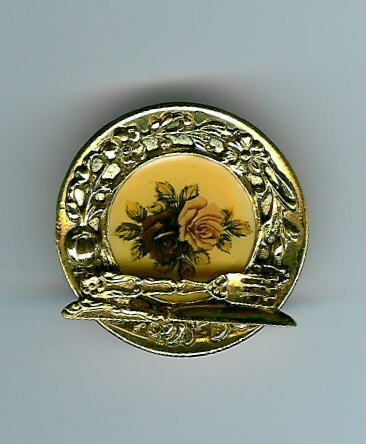 Vintage goldtone pin was signed by AJC (American Jewelry Company). Has cafe written in front of awning. Made in 1980's. Great way to promote cafe business by wearing with name tag when networking or meeting with clients. This vintage flowered plate with knife and fork is 2 inches in diameter. Great gift for a caterer or chef! 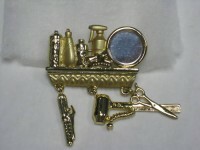 Vintage goldtone hairdresser pin signed Danecraft with many of the products and tools that a stylist uses. From the 1980's. Perfect to wear with a name tag at networking and client meetings to promote your business. The gold plated Betsey Johnson fashion pin is made with red rhinestones. It is 1-3/4 in x 1-1/4 in. Perfect next to your name tag if you are in the beauty business! 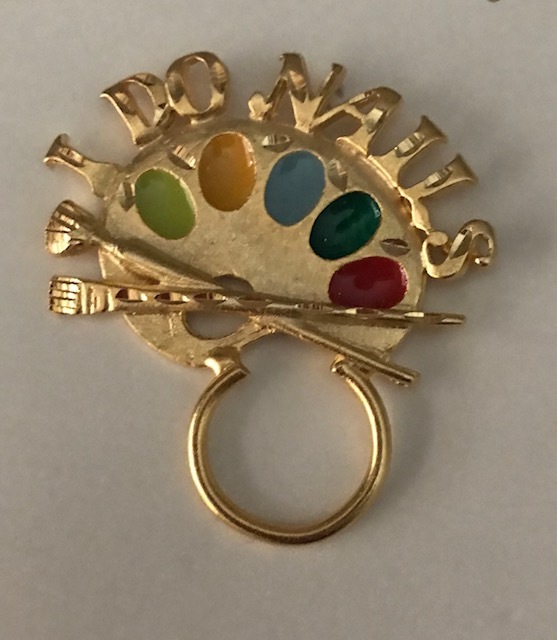 Vintage goldtone artist's palette pin that has a ring to hold eyeglasses. The palette colors are hand painted. You can also add charms or beads to the ring for a decorative and personal touch. 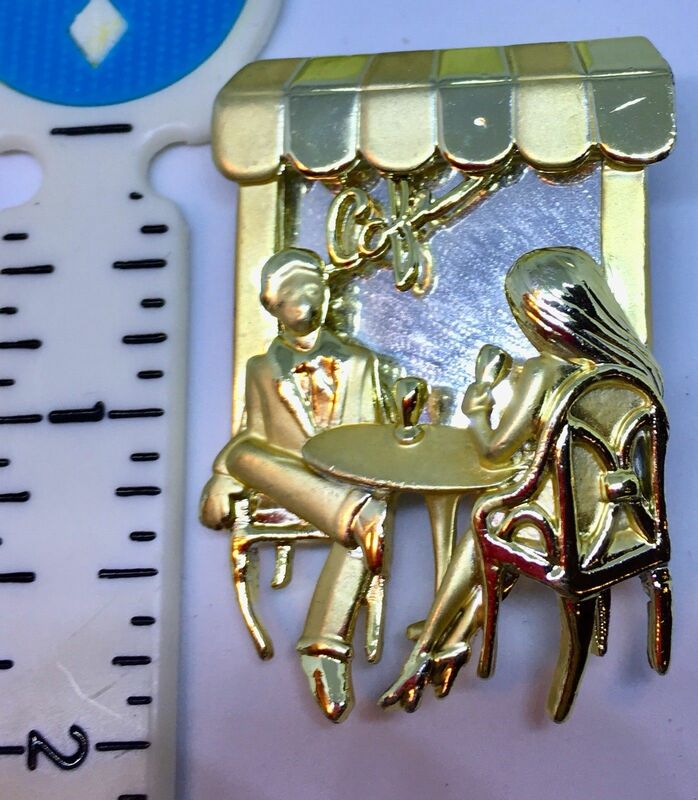 Pin is 2 inches x 2 inches. Perfect for nail techician or JamBerry consultant to promote her business while doing nails or at networking events. 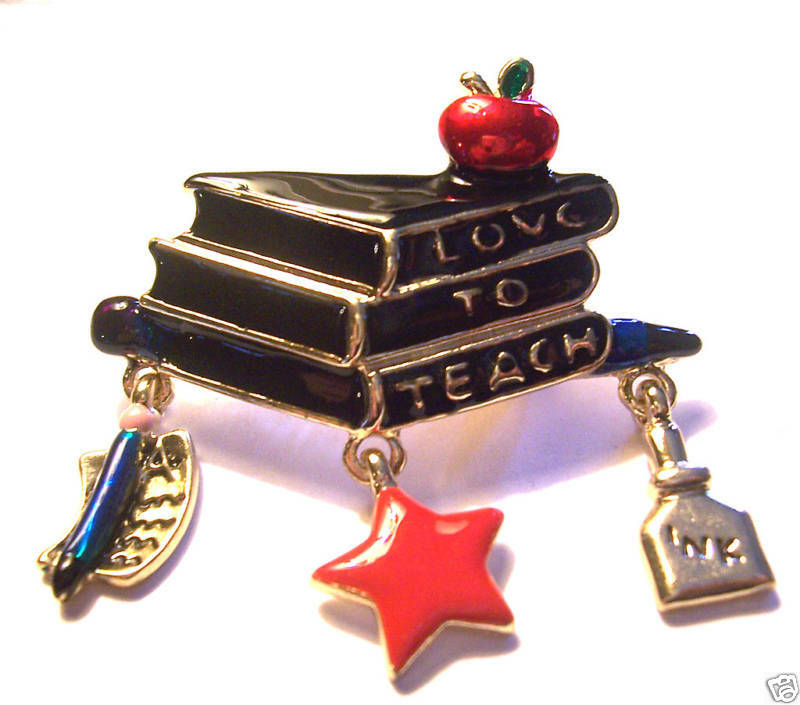 This gorgeous vintage pin is perfect for a teacher or a coach to wear with their name tag while networking. It is 2 inches tall x 2 inches wide. Also great gift! Vintage blue enamel and rhinestone peacock pin. Size is 2-1/4 inches high x 1-1/4 inches wide. 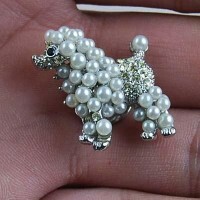 Swarovski crystals and faux pearls adorn this fashionable tie tack style pin. Size is 1-1/2 inches. 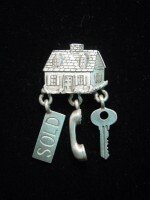 Vintage Matte Silver Pewter JONETTE JEWELRY (signed JJ) 'Real Estate House with charms of SOLD sign, phone and key Tac Pin. From 1980's. Pin measures approximately 1" wide x 1 5/8" high. Can wear under name tag when meeting clients and at networking events to advertise your business. 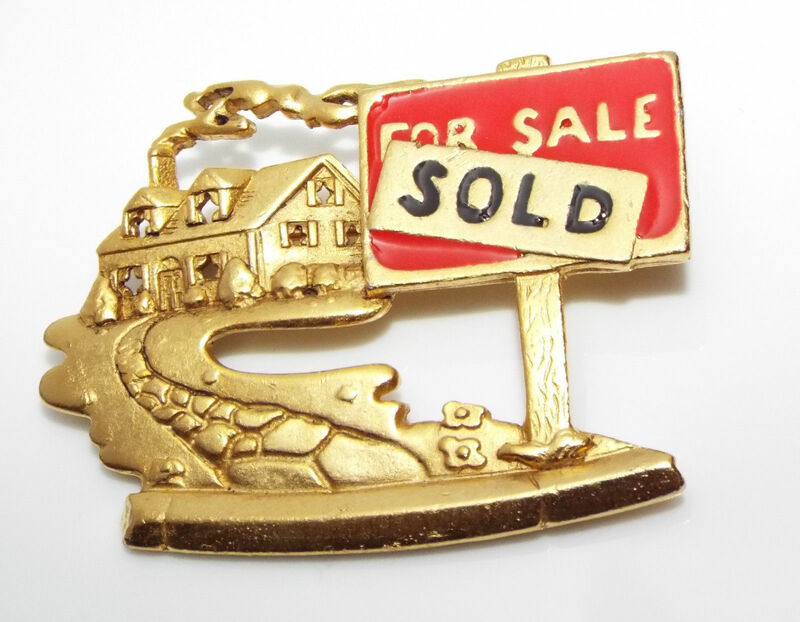 Vintage signed AJC Sold house brooch measures approx. 2 - 1/8 inches x 1 - 5/8 inches. Perfect for a realtor! Red Enamel, Rhinestone Crystals on Gold Plated Pin. It is 1-1/4" high and 2 " wide. 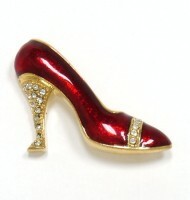 Great pin for Red Hat Society ladies or for shoe business to promote yourself. Adorable pair of sandals or pool / beach shoes adorned with deep blue enamel dots across the straps. Measures 1-1/16" x 1-1/16". Also has loop in back so can be worn as a pendant. This vintage pin features glittering rhinestones accents on plaid golf bag, clubs and a fabulous faux pearl golf ball! 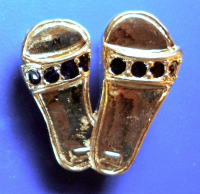 Measures approximately 1-5/8's inches wide x 2-1/4" tall. It is signed Danecraft. 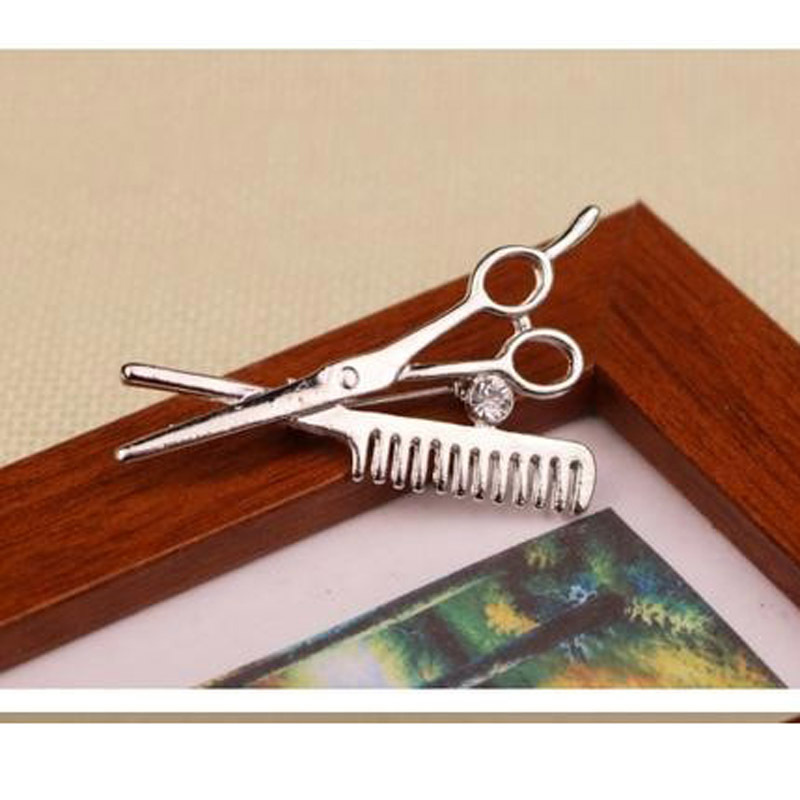 This hair stylist pin is silvertone and measures 1-1/2 in high x 1 in wide. Perfect for doctor or nurse! 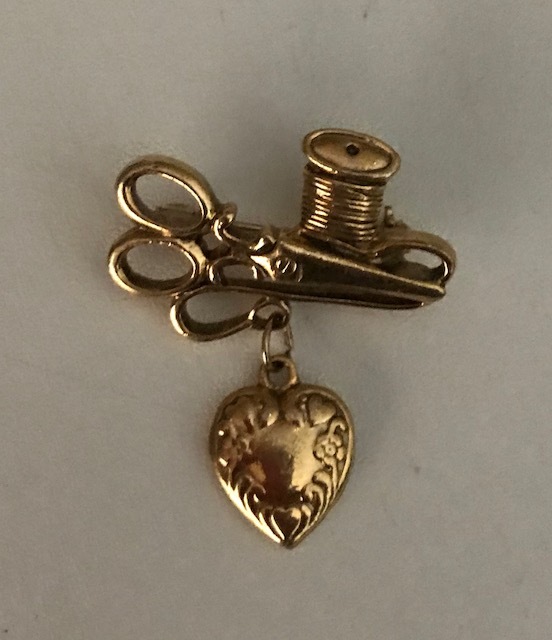 Vintage 1980's goldtone sewing machine pin with thread on top of scissors and heart charm. Size is 1-1/2 inches high x 1-1/4 inches wide. Perfect advertisement for your business. 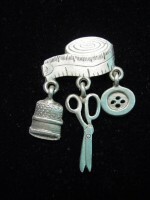 Silver Pewter JONETTE JEWELRY (JJ) Charms Pin for avid sewer or seamstress. 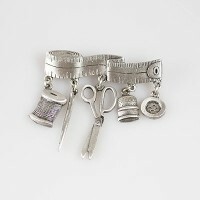 Charms are tape measure with thread/needle/scissors/thimble/button. Pin measures approximately 2 1/4" wide x 2" high. 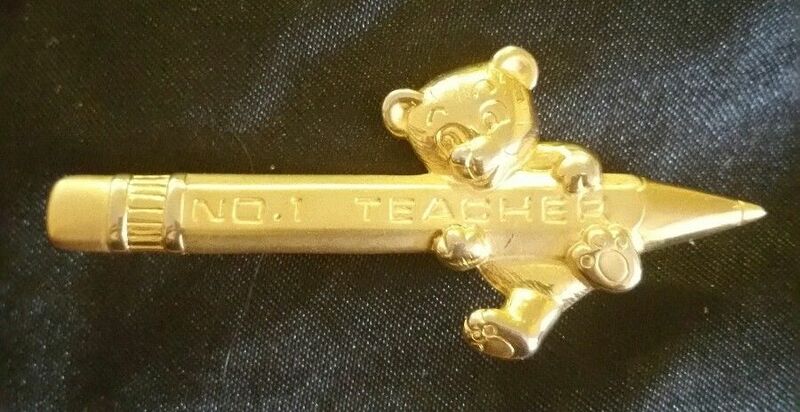 Vintage pin from 1980's. Perfect for seamstress or alterations business to wear by name tag when networking. Vintage silver pewter pin that is a smaller version of the other sewing/alterations brooch shown. Size is 1 inch wide x 1-5/8 inches high. 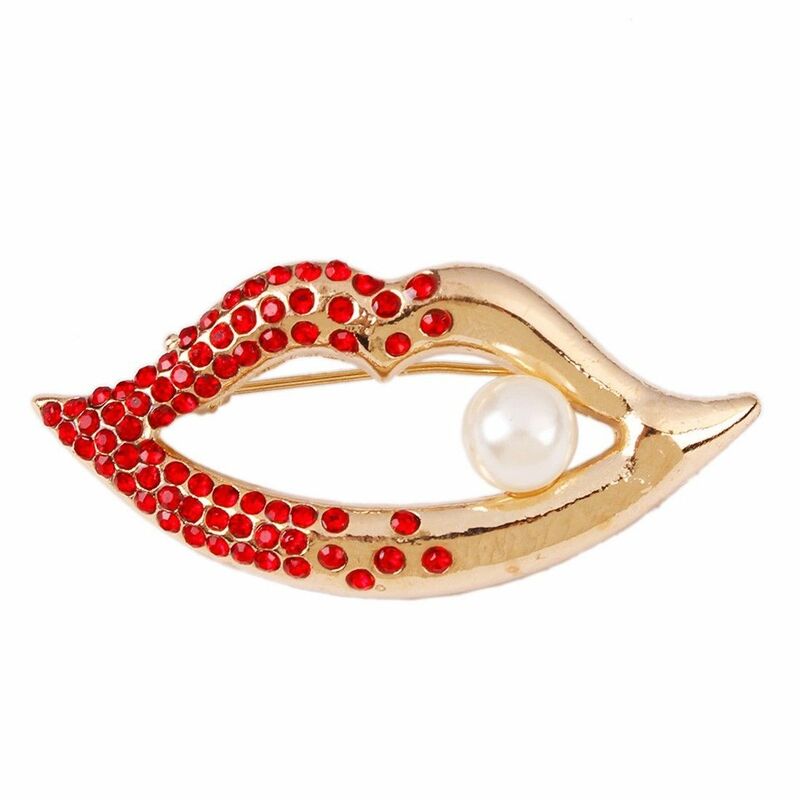 The gold plated Betsey Johnson fashion pin is made from red and clear rhinestones. It is 1-3/4 in x 1-1/4 in. Perfect way to advertise your business if you are in the beauty industry! Gets you noticed and remembered! 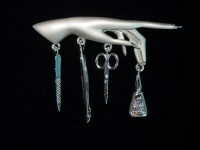 Silver Pewter Matte Finish hand with charms of Hand with nail file, scissors, clippers & nail polish pin. Pin measures 3" wide x 2 1/4" high. 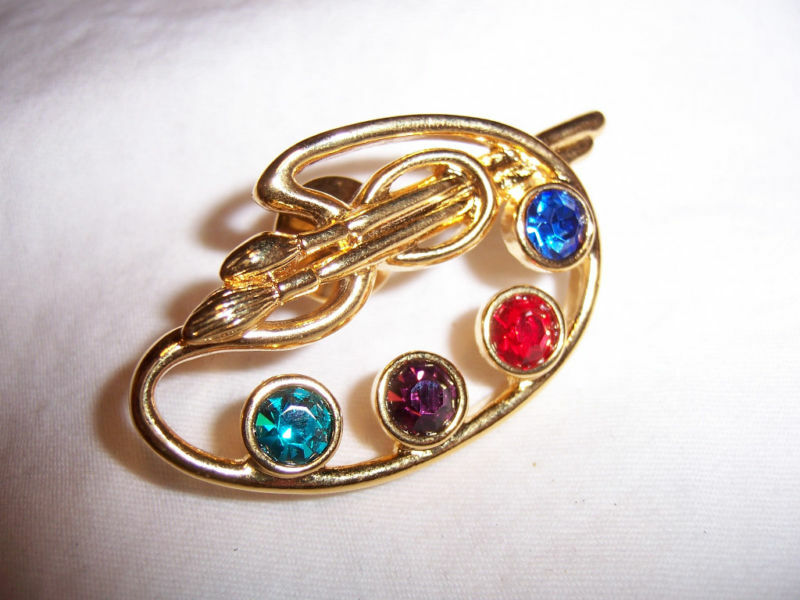 This vintage pin is signed by JJ (Jonette Jewelry) and made in 1980's. Also comes in gold matte finish. Price is for one pin. Specify whether want silver or gold. Perfect for advertising your business while networking. Just wear by name tag. 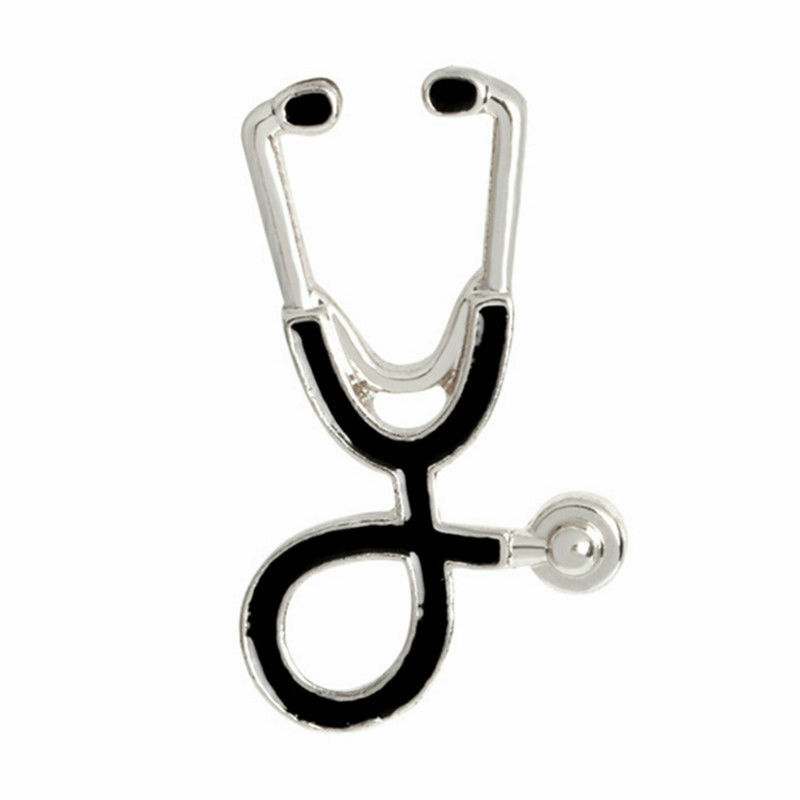 This gun metal stethoscope pin is perfect for a doctor or nurse to promote their business when networking. The pin is 1-1/2 inches high x 1 inch wide. This black stethoscope pin is edged with silvertone and is perfect for a doctor or nurse to promote their business when networking. The pin is 1-1/2 inches high x 1 inch wide. 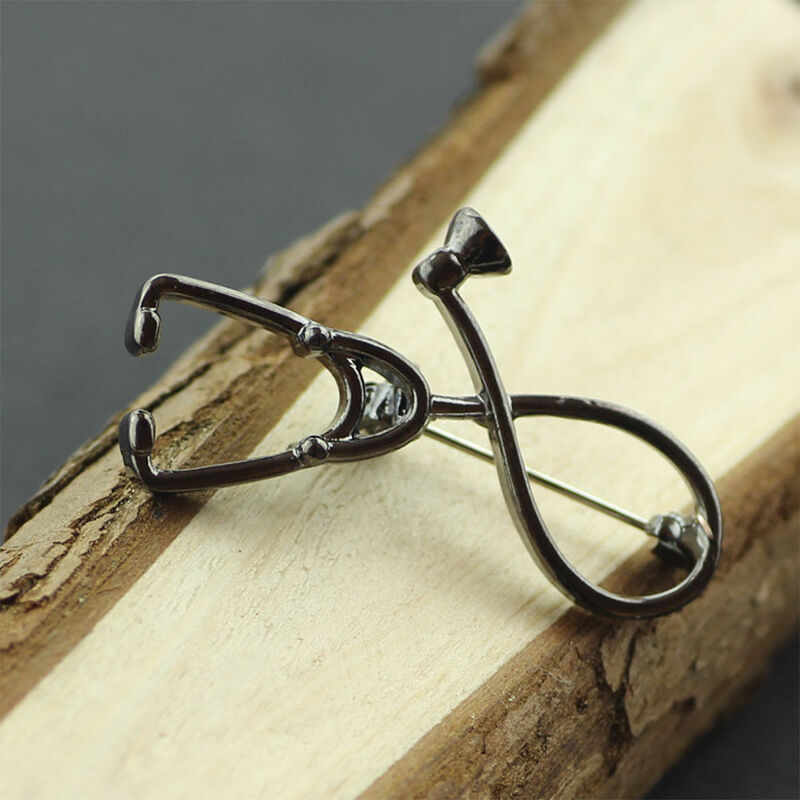 This silver stethoscope pin is perfect for a doctor or nurse to promote their business when networking. The pin is 1-1/2 inches high x 1 inch wide. 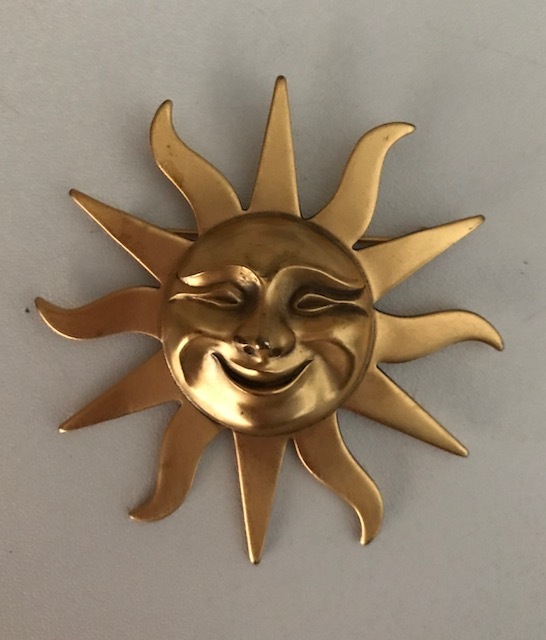 This Alva Museum Sun replica is a vintage brooch which is 2-3/8 inches in diameter. Great to promote beach or pool fashion or supplies and also for solar businesses! Or just for fun! 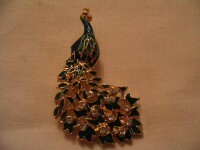 This vintage pin is made by Jonette Jewelry from the 1980's. (JJ stamped on back). It is 2-1/2 inches long x 1 inch high (at its highest point). 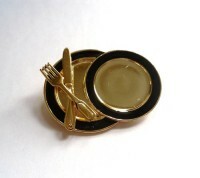 Gorgeous gold plates with black rim and gold utensils. Plates are 1 -3/4 inches high x 2-1/4 inches wide. Vintage pin was made in the 1980's and signed by Danecraft.